The story of a mysterious southern Illinois treasure cave and its proof of the presence of Africans in North America long before Columbus. • Includes over 100 photographs of the artifacts discovered. 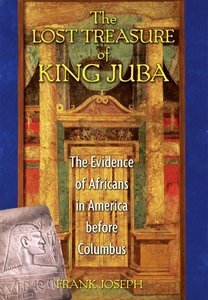 • Re-creates the historic voyage of King Juba and his Mauretanian sailors across the Atlantic to rebuild their society in the New World. • Explains the mystery of the Washitaws, a tribal group of African origin, first encountered by the Lewis and Clark Expedition. In 1982 Russell E. Burrows, a treasure hunter in southern Illinois, stumbled on a cache of ancient weapons, jewels, and gold sarcophagi in a remote cave. There also were stone tablets inscribed with illustrations of Roman-like soldiers, Jews, early Christians, and West African sailors. These relics fueled a bitter controversy in the archaeological community regarding their authenticity, leading Burrows to destroy the entrance to the cave. Researching more than 7,000 artifacts removed from the cave before it was sealed, Frank Joseph explains how these objects came to be buried in the middle of the United States. It started with Cleopatra, whose daughter was made queen of the semi-independent realm of Mauretania, present-day Morocco, which she ruled with her husband, King Juba II. Following the execution of their son, Ptolemy, by Emperor Caligula, the Mauretanians rebelled against their Roman overlords and made their way into what is now Ghana. There they constructed a fleet of ships for a transatlantic voyage to a land where they hoped to rebuild their kingdom safe from Roman rule. They took with them a great prize unsuccessfully sought by two Roman emperors: Cleopatra's golden treasure and King Juba's encyclopedic library of ancient wisdom. Download Link Fully illustrated with many previously unpublished photographs of artifacts retrieved from the southern Illinois site, The Lost Treasure of King Juba is a compelling story that could force us to rethink the early history of our nation and the possibility that Africans arrived on our continent nearly fifteen centuries before Columbus.